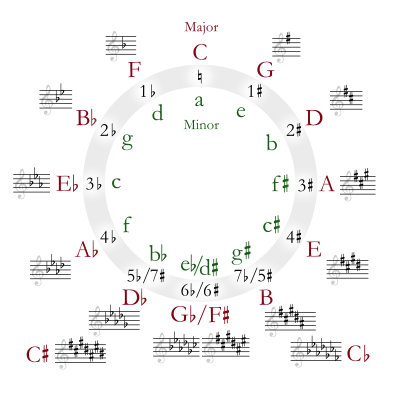 A minor scale in music theory is generally any scale that includes at least three essential scale degrees: one being the tonic, another at an interval of a minor third above the tonic, and another at an interval of a perfect fifth above the tonic, together composing the tonic minor triad. While this definition encompasses many scales and modes such as Dorian mode and the Phrygian mode, the term in its stricter sense is usually limited to the natural minor, harmonic minor, and melodic minor scales, described below, which are in most common use in Western classical music (see major and minor). The natural minor scale is the sixth mode (or Aeolian mode) of the major scale. For example, the white notes of a keyboard if played from any C continuing up an octave to the next C produce a C major scale. If the white notes are played beginning from the sixth step of that C scale, from any A to an A an octave above, then an A natural minor scale (the "relative minor" of C) is produced. The above considerations of chordal harmony led to the harmonic minor scale, the same as the natural minor but with a chromatically raised seventh degree. An important characteristic of the harmonic minor scale—in contrast to the natural minor—is its inclusion of two sets of chords whose inversions are structurally identical, and hence have ambiguous tonality. These are the Diminished seventh chord (found on the 2nd, 4th, 6th and 7th degrees) and the Augmented chord (found on the 3rd, 5th and 7th degrees). The harmonic minor is also occasionally referred to as the Mohammedan scale as its upper tetrachord corresponds to the Hijaz jins, commonly found in Middle Eastern music. The harmonic minor scale as a whole is described as Nahawand-Hijaz in Arabic nomenclature, or as Bûselik Hicaz  in Turkish nomenclature. A' G F E D C B A respectively. Composers have not been consistent in using these in ascending and descending melodies. Just as often, composers choose one form or the other based on whether one of the two notes is part of the most recent chord (the prevailing harmony). Particularly, to use the triad of the relative major—which is very common—since this is based on the third degree of the minor scale, the raised seventh degree would cause an augmented triad. Composers thus frequently require the lowered seventh degree found in the natural minor. In jazz, the descending aeolian is usually disregarded altogether. Major and minor keys that share the same signature are called relative; so C major is the relative major of A minor, and C minor is the relative minor of E♭ major. The relative major is a minor third above the tonic of the minor. For example, since the key signature of G major has one sharp (see major scales for how to find this), its relative minor, E minor, also has one sharp in its key signature. Gjerdingen, Robert O. (1990). "A Guide to the Terminology of German Harmony", Studies in the Origin of Harmonic Tonality by Dahlhaus, Carl, trans. Gjerdingen (1990). This article is licensed under the GNU Free Documentation License. It uses material from the Wikipedia article "Minor scale". Allthough most Wikipedia articles provide accurate information accuracy can not be guaranteed.